Mumbai, 22nd March, 2016 - High-street fashion label, 109˚F, and fashion designer, Nishka Lulla, unveiled their brand new collection at Tote on the Turf. Models flaunted the vibrant collection featuring jumpsuits, dresses, Nishka’s signature twin-sets and more. 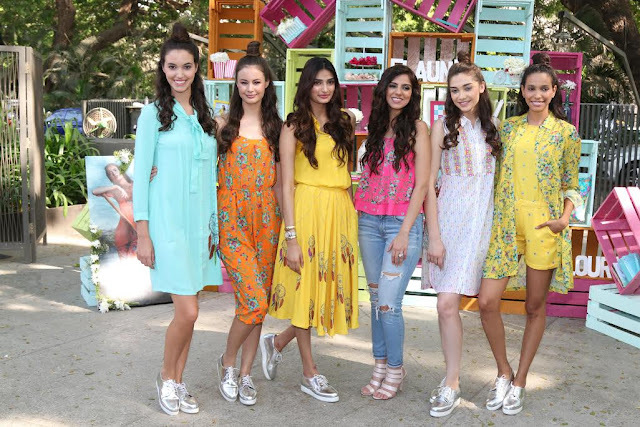 Dreamcatchers and florals were the predominant motifs accompanied by bright summery hues. Athiya Shetty flaunted her inner fashionista donned in 109˚F by Nishka Lullla at the event. 109˚F is a high-street, new age fashion brand that brings finely-crafted designs for the urban Indian woman. The collection design is inspired by the floral and tribal arts, and reflects the bohemian mood of the urban girl who is passionate and fuss-free. Ideal for every young woman with streaks of irreverence hot-stamped into her DNA, the styles can be identified by young women all over. The splashes of neon reflect their fun, non-conformist side and inspire free-spirited women to flaunt their true colours. Sharing her excitement, designer Nishka Lulla said, “I am so glad to collaborate with 109˚F! I think it’s a great fit as the focus of the brand is comfort and style which compliments my sensibilities as a designer”. Speaking about the association, Mr. Rahul Mehta, Managing Director, 109˚F said, “This is one of our most exciting new collections and it’s truly global in its aesthetic. It gives you a fresh burst of confidence and energy”. The collection will be in stores in the 1st week of April in Mumbai, Delhi, Bangalore, Calcutta, Hyderabad and Pune. The price ranges from INR 1800 – 3500. Creative Group, founded in 1973, is one of India's leading exporters, exporting garments to most leading Fashion Houses across Europe and America. In 2006, realizing its ability and versatility of offering creatively designed women’s wear across various categories 109°F brought international fashion options with Indian sensibilities. In a short span of time 109°F has become one of the leading brands in its category in India. Nishka Lulla, who graduated from SNDT College in Mumbai, is a name that has set a distinct identity of being a young, crisp and dynamic designer. Nishka Lulla is currently one of the leading designers in the fashion industry, brain-child behind two established clothing lines: “Nisshk”, a traditional fusion line and the new born “Nishka Lulla”, the boho traveller chic prêt-e-porter line. Nishka dazzled through to spotlight after winning the “Creative Excellence Award” for the “Barbie all Doll'd up” show at Lakme Fashion Week 2009, where India's leading designers participated to design an outfit for Barbie’s 50th Anniversary. The outfit today is being displayed at the Barbie museum internationally. Adding to her accolades, Nishka also recently bagged the Grazia award for “Designer of the Year 2014”.